There truly is nothing like fresh Italian pasta. Something about the combination of comforting starchy noodles and tasty fresh sauces makes all my troubles go away. After traveling throughout Italy, I was so inspired by their use of simple ingredients. A little garlic, tomato and wine and you had one of the most delicious pastas you ever tasted. So any home cook probably did the same thing as me. The second I got home I went to my local grocery store and picked up what I thought was the same garlic, tomato, wine etc… Cooked everything the same way I had learned from nonna and voila! I had a meal that tasted like true… Italian…leather. Why didn’t it taste the same? I added the same amounts, the same ingredients… was it me? Was it my stove? No… in fact it was those “same ingredients” that really weren’t the same at all. A tomato grown in nonna’s backyard is not the same tomato you get at Publix, Provigo or even Whole Foods. I think that most North Americans are making pretty average tasting dishes in general because of one simple mistake. Sh*t ingredients. I really came to truly believe this after The Barefoot Contessa herself, Ina Garten, bullied me enough through the TV to buy those good quality eggs, good quality olive oil, good quality vanilla etc…She always said “make sure its good quality.” I thought, oh olive oil is olive oil. Take it from me, it is not the case. Test it yourself and I promise you will end up coming to the same conclusion as I did. Listen, I know its hard…. you don’t want to go to the market, or spend so much extra on that expensive maple syrup when you can just get some Aunt Jemima. But knowing where to stretch your dollar and where to spend a little more is the difference between a bland boring dinner, to one that tastes like you are eating at a winery in Tuscany. That is truly how Italians make their food taste unbelievably delicious. They aren’t putting red wine from the 7/11 or depanneur into their marinara. It isn’t 55 crazy expensive ingredients that you can’t pronounce or understand. They use simple, good quality ingredients and cook them right. They showcase the taste and quality of the ingredients themselves. I know its tempting to buy that 99 cent can of whole tomatoes but those San Marzano ones in the can for $4.99 is the epitome of the Olive Garden vs. Tuscany debate. Heres my must-do list when making a fresh pasta at home. 1. 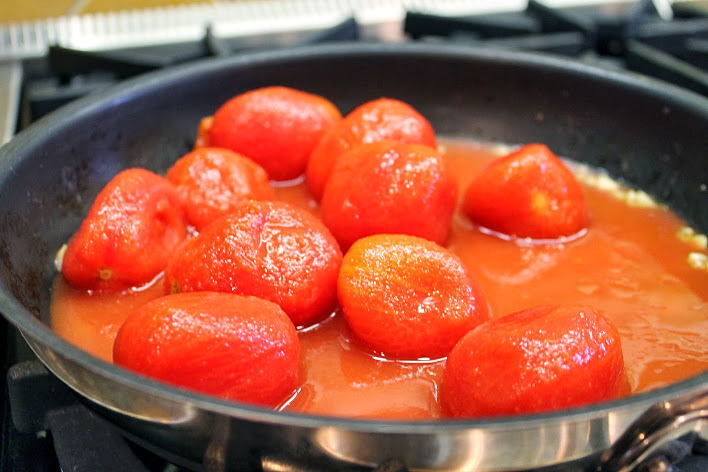 If making a tomato sauce, always buy San Marzano tomatoes from the can… not San Marzano type… just San Marzano. 2. Always add wines into your sauces that you would drink from a glass. 3. Fresh pasta (bought or homemade) can take your pasta to the next level. 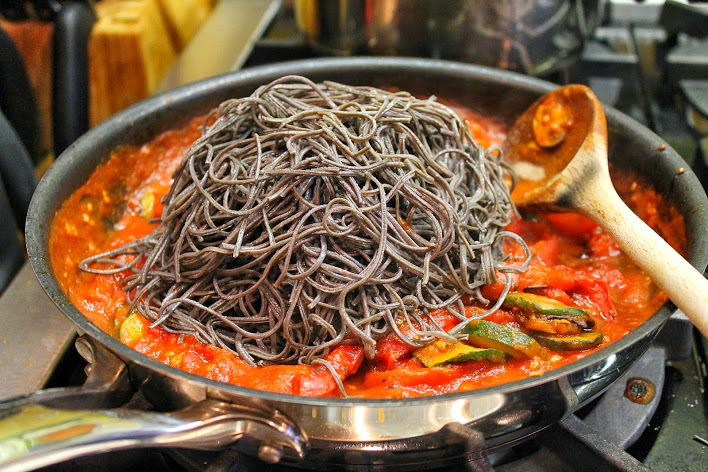 But boxed pastas are just fine! 4. Don’t use jarred or dried garlic/onion. Buy fresh. Cut fresh. 5. Invest in a good quality olive oil that tastes great to you. Most markets or speciality food stores will let you taste the olive oils. Bring your own Gfree crackers or bread and test it out! Plus they’ll give you the best information on which ones to cook with and which to only use on salads or as garnish. 6. Don’t forget the fresh herbs. Fresh basil can make the world of difference in any pasta dish. If you are making a heavier pasta, any fresh herb or green will lighten (and brighten) up the dish. (If you don’t have basil on hand, add a little fresh kale or arugula). 7. Boil your noodles in heavily salted water. The noodles absorb the water they are cooking in, so you want those noodles seasoned!Don’t use the expensive stuff here. Kosher salt is perfect! Now for the pasta recipe! 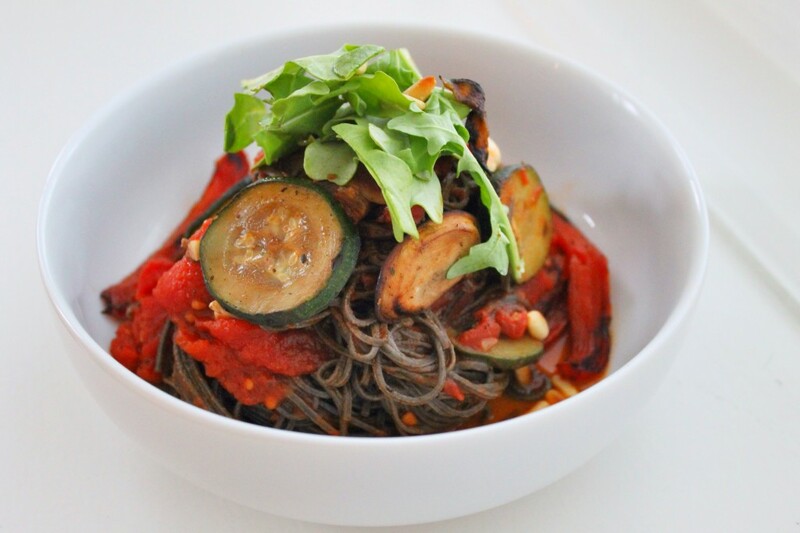 This pasta is full of protein and healthy fats from the black beans and pine nuts. Feel free to add shrimp, chicken or ground turkey for a little meaty touch. 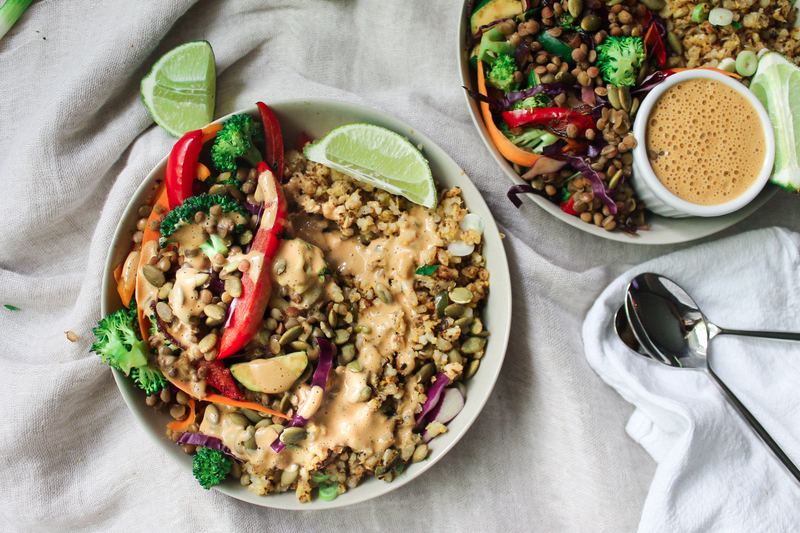 But on its own it is truly satisfying and perfect for Meatless Mondays. If spice isn’t your thing, simply leave out the chilli flakes and hot sauce. Buon Appetito! 1. Chop all ingredients so they are ready to go! (separate them in bowls or on your cutting board). 2. Heat 1 tbsp of olive oil in a deep skillet on medium heat. 3. Once the oil is hot, add the shallot and sautee until soft. Then add garlic and chilli flakes, salt and pepper and sautee for another 30 seconds. 4. 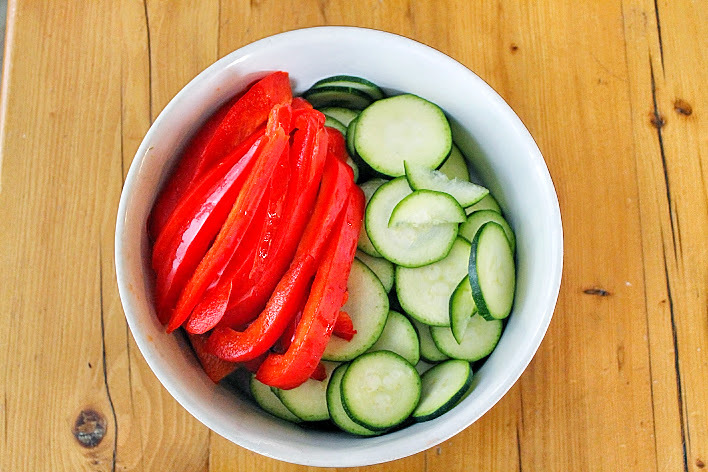 Add canned tomatoes and crush with a wooden spoon or cut with kitchen scissors. Bring to a boil, then put heat to low. Add tomato paste and stir until combined. Let simmer until most of the water has evaporated (about 30 minutes). 5. 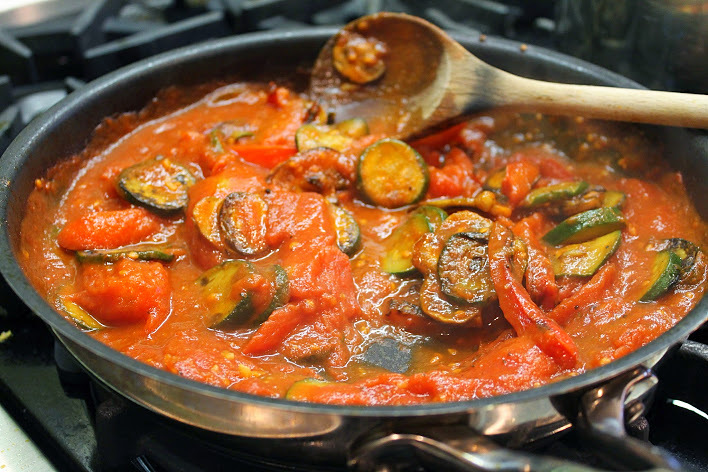 While the sauce is simmering, heat the other tablespoon of olive oil in another skillet on medium heat. Add olive oil and sautee for 30 seconds. Then add zucchini, peppers and mushrooms, salt and pepper. Cook until tender and slightly brown. 6. Now its time to boil your pasta according to the directions on package or box. If you bought fresh pasta, then cook it in heavily salted water for 2-3 minutes. 7. Back to the sauce…after the sauce has thickened add the red wine. Stir and taste. Add hot sauce if you want more heat, and adjust salt and pepper seasoning if necessary. 8. 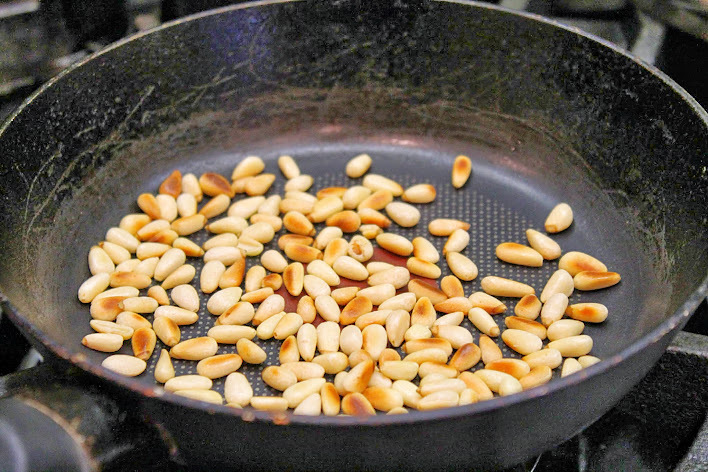 Toast your pine nuts on medium heat in a dry pan until golden. Watch carefully or they will burn (5 minutes). 9. Add the vegetables to the pasta sauce, stir. Then add the noodles. Toss until well combined. 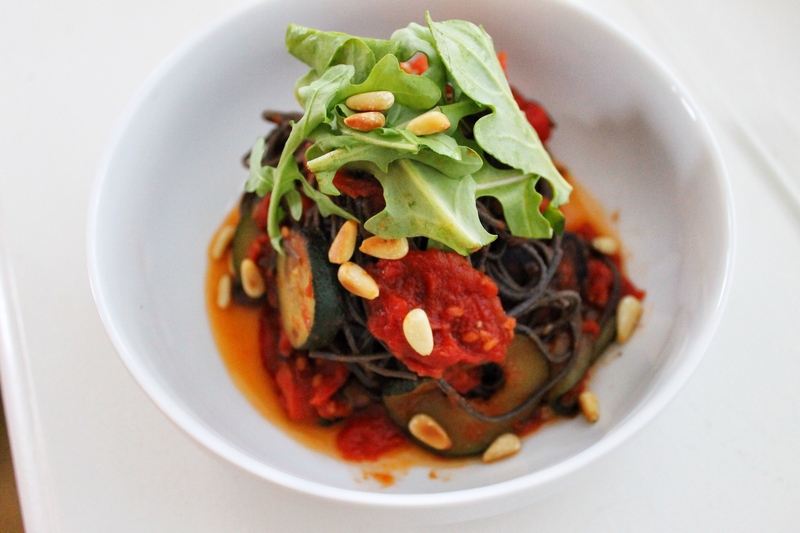 Top with fresh basil or arugula and toasted pine nuts. We all know by now how great kale is for you. Everywhere I go I see kale in many forms. 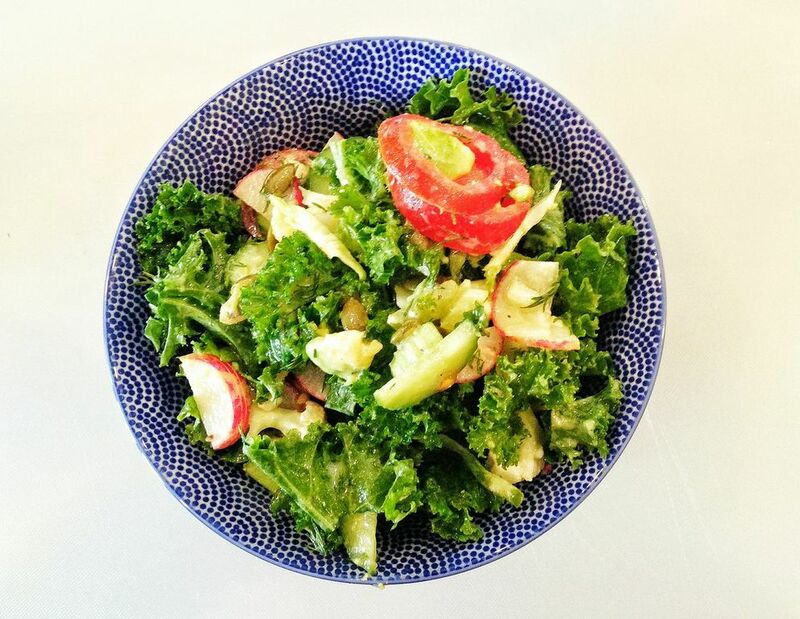 Whether it is raw, sautéed, fried or oven baked, kale packs a mean nutritional punch. Kale is by far my favourite green for salads. 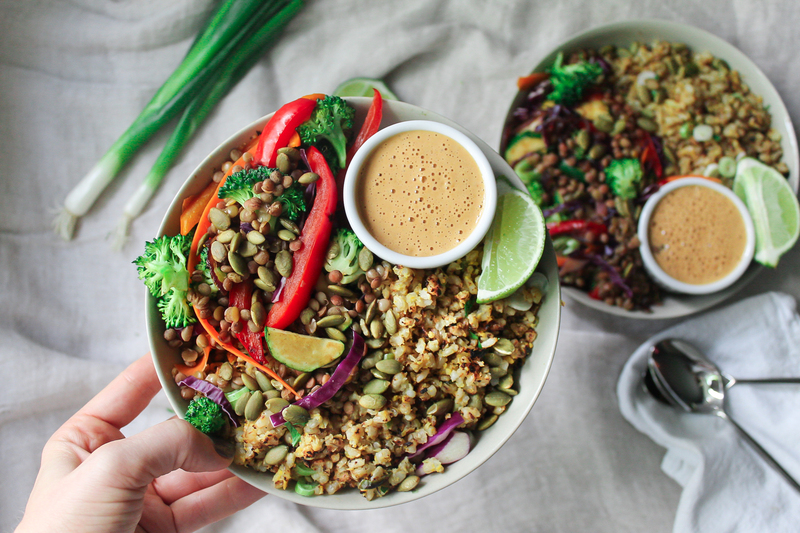 It is crunchy, tasty and holds onto dressing like no other green. Kale is full of fibre, vitamins, antioxidants, and iron. It is detox friendly, anti-inflammatory and has cardio vascular support. Oh and… for all you dairy lovers, per calorie, kale has more calcium than milk! The whole milk makes your bones strong ordeal was really just a marketing campaign that helped boost dairy sales. What does this all mean? This is only one of the many kale salad combinations I make. I also add kale to smoothies, make chips and puree it into cauliflower for a beautiful green mash! 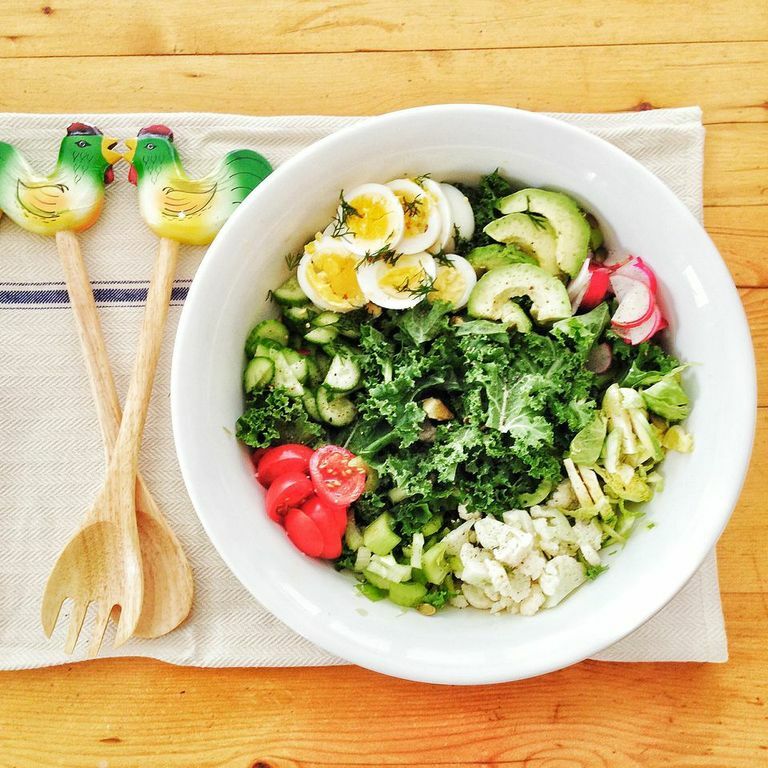 This salad is filled with beautiful raw veggies, roasted sunflower seeds and hard boiled eggs and avocado for extra protein and healthy fats. I topped this salad with a mustardy vinaigrette and freshly chopped dill. 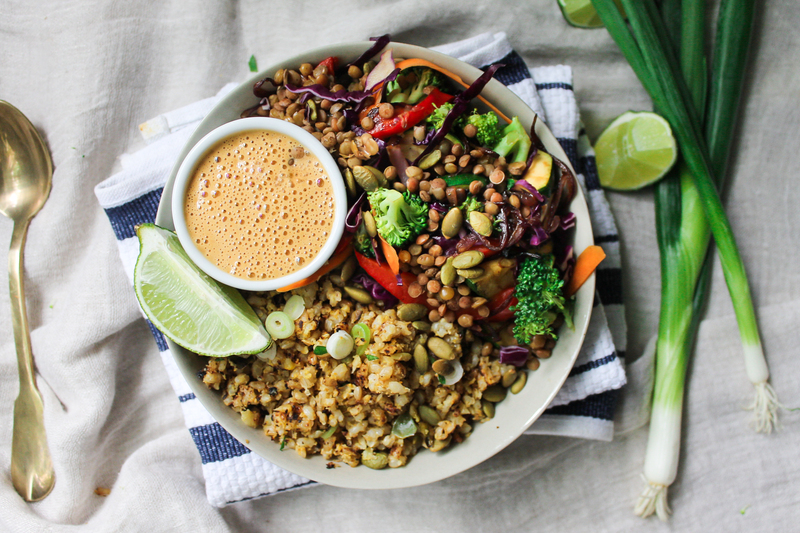 It is so wonderful and fresh and is great for a filling lunch or a light dinner. Bon appetit! 1. For eggs: pour cold water just enough to cover the tops of the eggs. Sprinkle in the salt. Heat the pan on medium high heat until water stars to boil.Once the eggs begin to boil, remove from the heat, and allow them to sit in the hot water for 15 minutes, covered tightly by a lid. 2. Rinse kale very well and chop. Remove tough stems. 3. 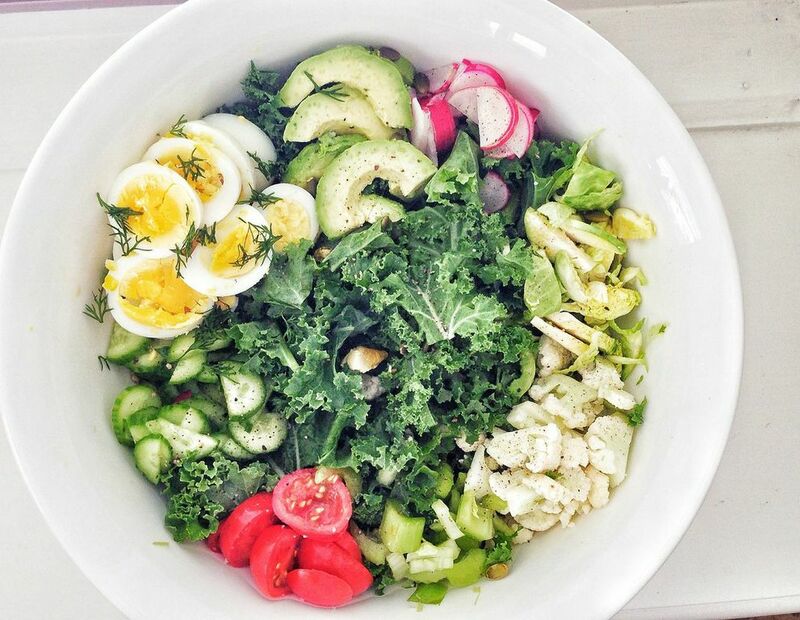 Chop veggies, eggs, avocado and dill. 4. For vinaigrette: whisk lemon juice, Dijon mustard, vinegar, and garlic in a medium bowl. Gradually whisk in oil. Season to taste with salt and pepper.